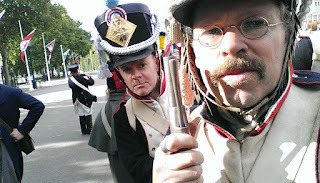 Left foot forward (a journey into reenactment): Beating the retreat. 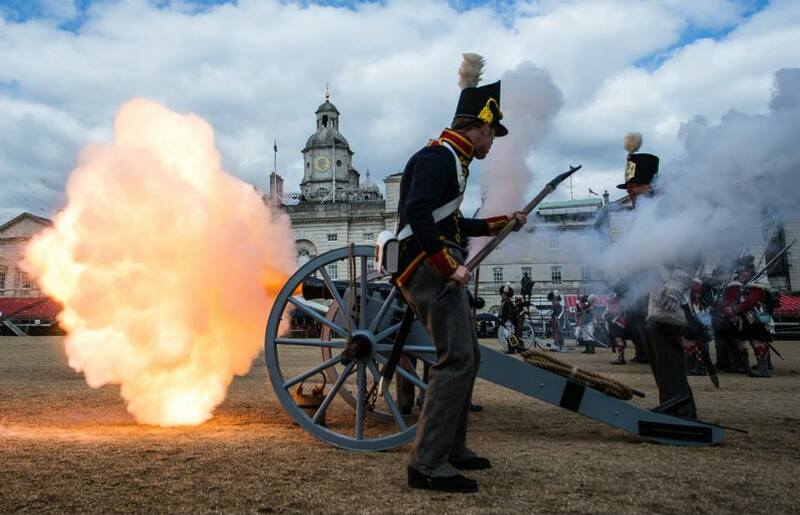 'Beating the retreat' is a yearly parade at Horseguards and given it being 200 years since Waterloo it was decided to have that as the theme. 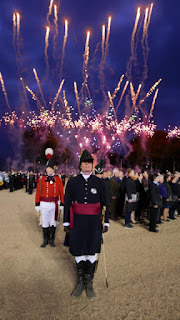 The Napoleonic Association was invited to take part although exactly what we would be doing would not be revealed until rehearsal day in a briefing that reminded me of the armoured division one from 'A bridge too far' with Arnhem replaced by the royal box. 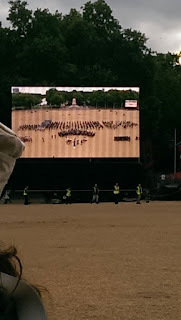 My favourite bit was when we as premiere section march to the far end in column behind a band then turn to line and in spaced pairs run between the open files of the band as the music plays and they stamp there feet. It was one of those moments that stays with you and must have looked pretty good, one unit passing through another to reform as a firing line in front. Those of us staying were bussed back to a cadet training centre in Blackheath with dorms and comfy beds, and with most of the next day free a bunch of us wondered down to Greenwich which seemed a nice place, remind me to buy a house there one day, there or Richmond. We looked at the Cutty Sark and had brunch and bought some drink for that night after the show. Bussed back. Wait about. Ate vege chow mein for £1.57 curtesy of the barracks canteen. form up on the front parade ground (and wait) and away! Everyone was in full fig uniforms now, shiny breastplates and bearskins. infact shiny everything! the bands played us down birdcage walk and around into the park as the Napoleonic invasion was meant to be a surprise. Waiting and watching. Played spot the snipers. Failed. Half a point for observers. 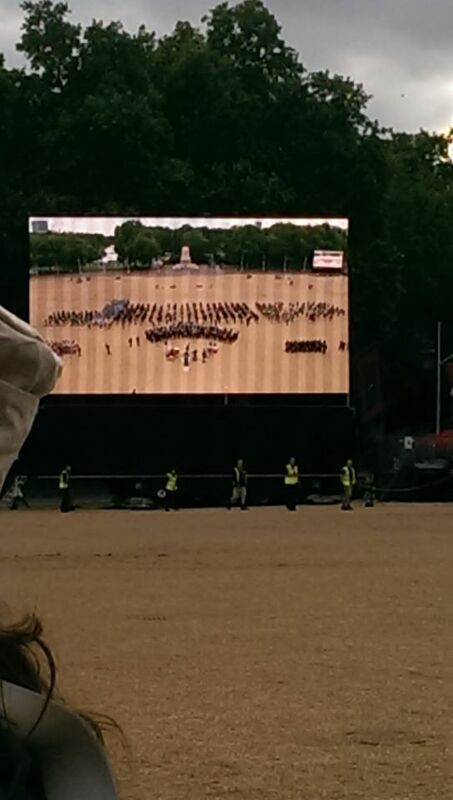 Then on, I felt a bit nervous as we rounded the corner onto the parade ground, most of us did. The bright lights. The open ground. The music. The crowds. 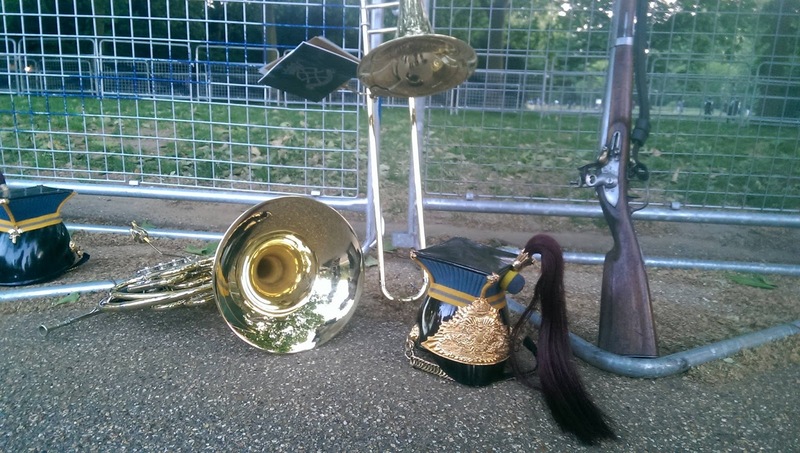 The fear of tripping over your own feet and knocking a bandsman flying! Through the band and into line, once loading and firing all nerves are gone, it's the same old battlefield miscocosm. 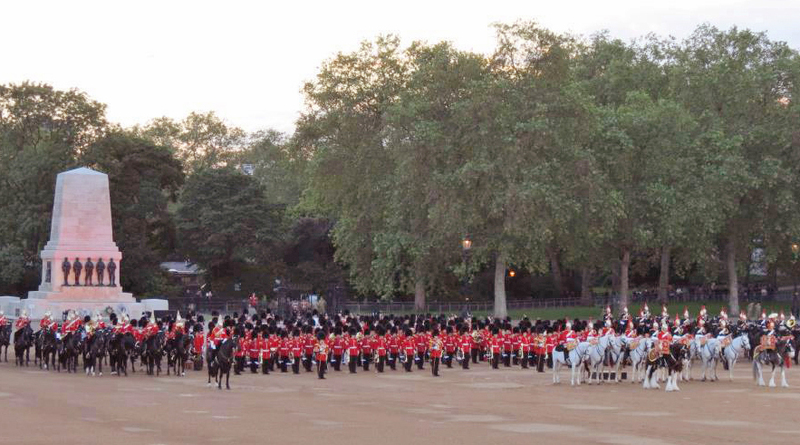 Before we know it we are falling back and forming up to stand to attention at the front left. 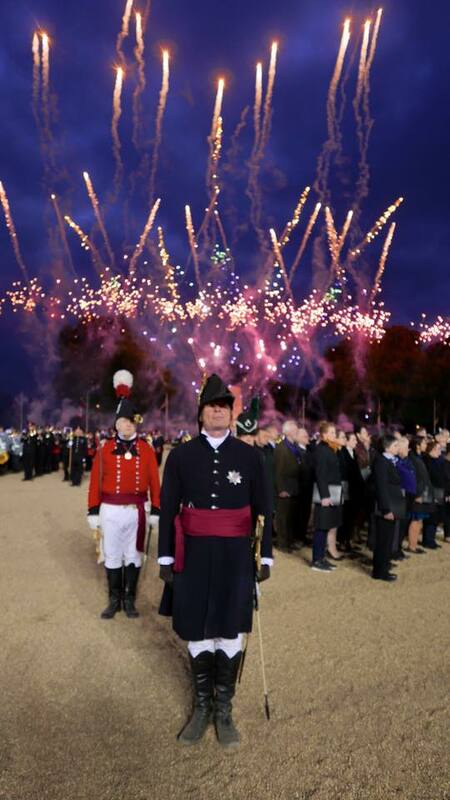 There followed several musical pieces, including a choir singing 'Amazing Grace' that merges into the same tune from the pipes and drums and was another moment to remember, fireworks went off, The German and British national anthems go by after a bugle was played that had been found next to a dead bugler at Waterloo. The German ambassador was whisked away in a car. 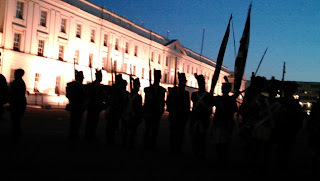 Then everyone was marching off the parade ground. March back to Wellington barracks, a bit of singing, people are in good spirits. Back on the bus. A few beers and chatting and before you know it it's half two. Time for bed. Next morning get up a bit later, relaxed morning, clean musket out in the garden with other folks sewing and mending and cleaning. Pack everything together and get kitted up. Back on the bus. Things run pretty much the same as yesterday. The Queen had been anticipated but for whatever reason didn't appear.. but the Duchess of Cornwall and the current Duke of Wellington were in attendence. It was great to be part of this. I never would of imagined four years ago that one day I would be marching and firing on a famous parade ground with the British household divsion in front of Generals, ambassadors and royals, and being quartered and fed and getting a bandstand view of some of it. I got to see all the behind the scenes preparation and rehearsals and a working army barracks, there were some aching feet and backs involved by the end, especially on last day as I was going to get the train after and had everything I'd taken in/on my pack, in fact the forty minutes or so of standing to attention, eyes forward, was probably more demanding than the short span of running about before it, but it was all part of a wonderful experience. 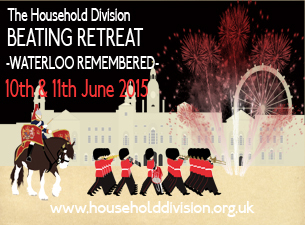 Fantastic few days, and this time next week I'll be in Belgium at the actual Waterloo, it's all suddenly upon us all!